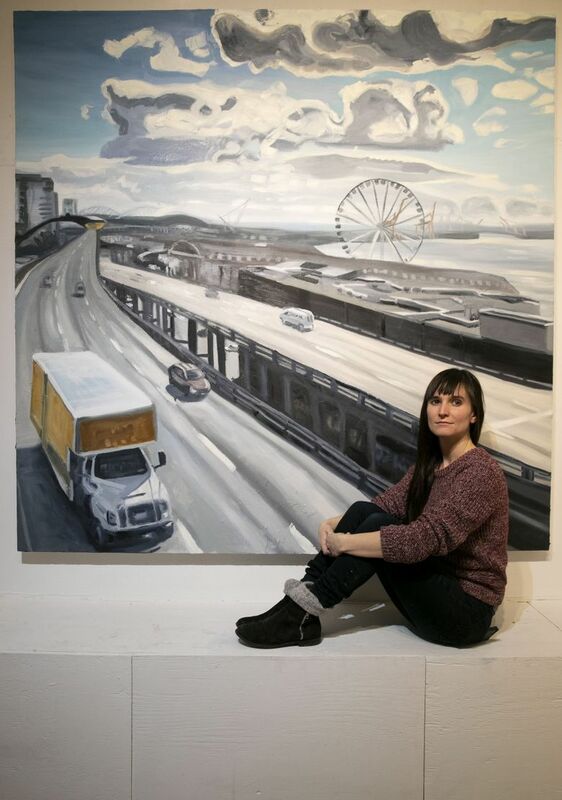 For two years, Laura Hamje has been painting the Alaskan Way Viaduct. 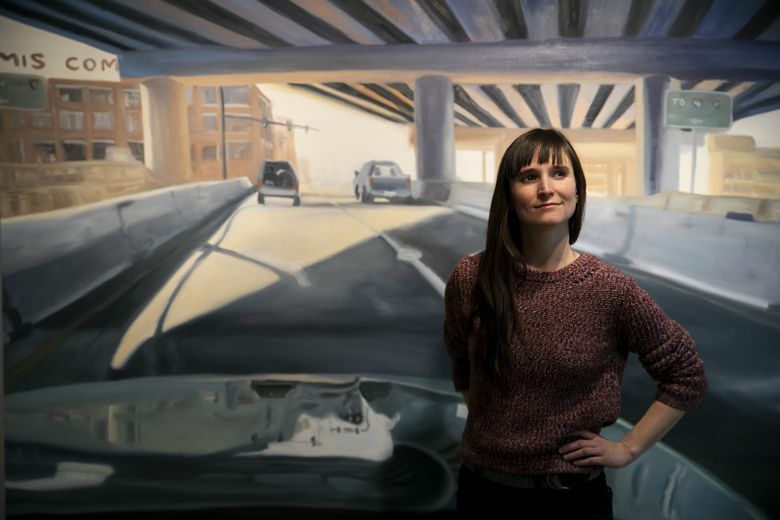 Her exhibition of paintings opens right as the viaduct is set to be torn down. But after all this time, Hamje is like a lot of us: Still not sure how she feels about the concrete colossus. Laura Hamje can’t stop taking pictures of the Alaskan Way Viaduct. Every time she drives or rides on it, at least 100 cellphone snapshots. Time is indeed running out. The viaduct will close for good in a month. About a month after that construction crews will begin the arduous, $75 million task of tearing down the 65-year-old concrete colossus. You may have your own photos of the viaduct. Maybe you’ll get a piece of the rubble. But Hamje, 32, has spent the last two years creating a more durable, comprehensive memorial of the massive elevated highway that’s dominated Seattle’s waterfront since the middle of last century. Hamje’s exhibition, “53 Views of the Alaskan Way Viaduct,” opens Thursday at the Bryan Ohno Gallery in the Chinatown-International District. 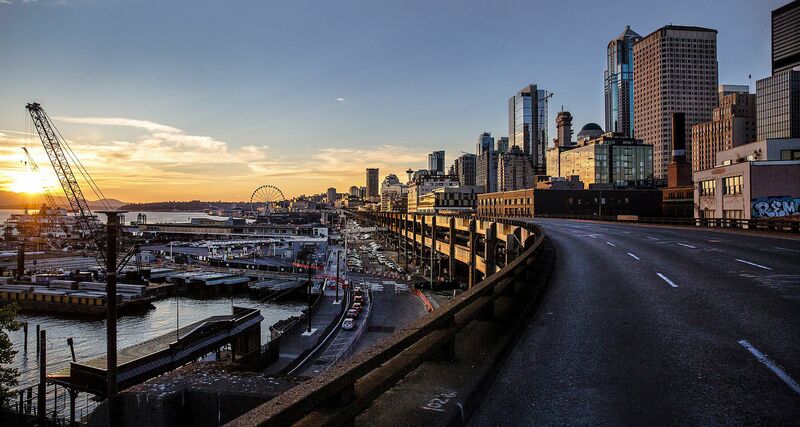 We’d like to feature photos you’ve taken on the Alaskan Way Viaduct. Please email a high-resolution photo to trafficlab@seattletimes.com and we may publish them. Please review our terms and conditions before emailing us. The show is what it sounds like: Nearly five dozen paintings, in a variety of media and sizes, of the viaduct from on, above, below and adjacent to the structure. All are drawn from the cellphone snapshots that she compulsively takes, of the viaduct in sun and rain, day and night, cruising through the city and idling in exhaust. Her paintings capture the full experience of the viaduct. There’s the glorious view everyone will miss, headed north, a teeming city on one side, the Sound unfolding to the Olympics on the other. There’s also rainy traffic, beneath a dingy concrete roof, bleary red taillights at once piercing the gloom and signaling the gridlock. There are overhead pipes, orange construction signs, road-blocking semis, brick buildings and pillar after concrete pillar. There are utilitarian Port of Seattle shipping cranes. And there is the glittering Great Wheel. There is open, inviting roadway. And there is rush-hour snarl. Bryan Ohno, the gallery owner, said that Hamje found human moments that dwell in and around the behemoth structure. 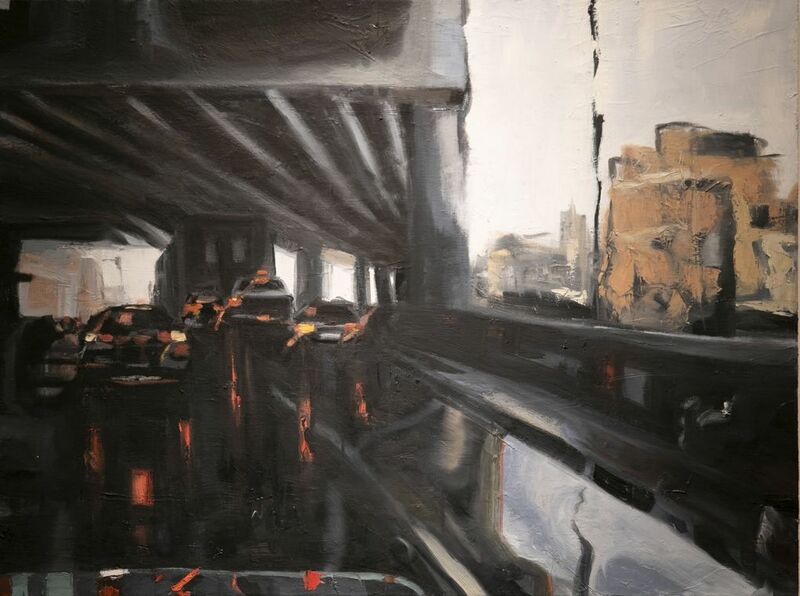 He hopes that looking at Hamje’s paintings — say brake lights, reflecting off stalled cars, surfaces and puddles — will spur specific memories in a viewer, in a way that photographs do not. As an artist, Hamje has long been interested in human-made structures — roadways and bridges. She started looking closer at the viaduct a few years ago, when she realized it was coming down. She painted it a couple of times. Ohno encouraged her to make it a series. It’s modeled after “53 Stations of the Tokaido,” a 19th century series of Japanese woodblock prints that also show a waterfront arterial highway: a horse and pedestrian route that connected Kyoto with present-day Tokyo. She never sets out to capture a crystal clear day or a fiery sunset. She just snaps viaduct pictures in the course of her travels, usually between her boyfriend’s house in Green Lake and their climbing gym off Rainier Avenue. Later, in her Little Saigon studio, Hamje will scroll through the hundreds of snapshots she’s taken, waiting for one to grab her. A photo gives her a feeling. She paints it, and the painting, in turn, inspires feelings in others. But after more than two years of incessant looking at, and thinking about, the viaduct, Hamje’s like a lot of us — still not sure how she feels about it. It’s noisy, it’s polluting, it severs the waterfront. But it moves people — well over 100,000 a day. It’s got those views. And it’s just been a part of daily life for so long.